Wishing you all a lovely Easter, a few days of rest and relaxation and a fantastic time! Toast on dark sourdough bread? Weird, you might think, but it’s quite common in Austria, and quite tasty. 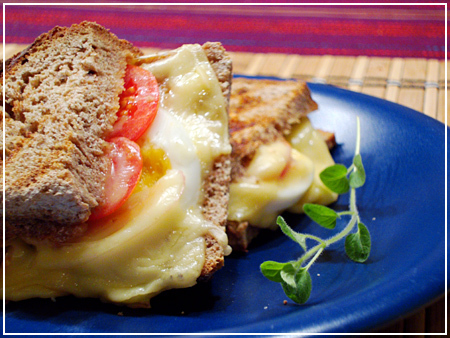 It’s generally known as Bauerntoast, or “Farmer’s Toast” because of the generally homemade farmer’s type bread. It’s also very easy to make on a foreman grill or waffle maker. Just cut some bread, put it on the grill, toss in sliced cheese (something tasty, please, like Emmental or at the very least Gouda), hardboiled egg (see the lovely golden yolk? YUM), onion and tomato slices, another layer of cheese and top it with another slice (or leave it open if you like grilled cheese). Eat with ketchup, mayonaise, mustard, all of the above or neither. The bread I used is the rest of the piece of Spelt bread I took home from Austria, by the way. It is delicious – a slice of this farmer’s bread will leave you completely happy and satisfied even without all the trouble with the toasting. It also will keep for ages even without the modern technology of plastic bags and fridges – a linen sack is quite enough for it, according to the testimony of people who actually lived when everybody was making their own bread still. I will definitely attempt to get hold of some spelt flour around here and make the bread myself. I assume the dough is quite similar to that of my walnut bread that I made a while ago – the pre-dough is prepared to rise the day before the bread is made, and the dough rises quite a bit more afterwards. Oof – good bread needs time! I’m not sure where I will find that ingredient, either. But it’s worth making some time for lovely bread, definitely! 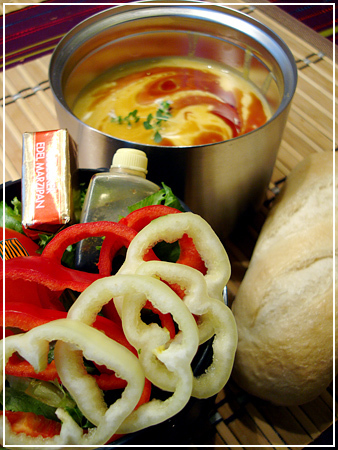 It’s that time again – autumn and time for Pumpkin soup. Lovely butternut squash soup in the thermal container, decorated with a cream and pumpkinseed oil swirl and some oregano. The top box holds crisp lettuce, a whole organic/locally grown tomato (YUM! ), and sliced bell peppers, a bottle of olive oil and balsamico vinaigrette, and a piece of marzipan chocolate. There’s also a piece of baguette that I packed on top to add some starch (and calories!) to the menu. PS: You can also make the soup vegan and a little more asian-style by adding coconut cream (and some lemongrass) instead of the stuff squeezed from cows. 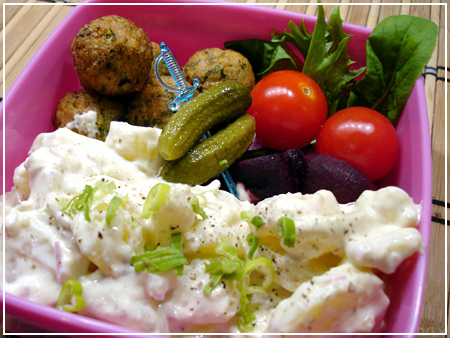 I finally cracked and made my own potato salad and “meatball” bento – looks Scandianvian, doesn’t it? 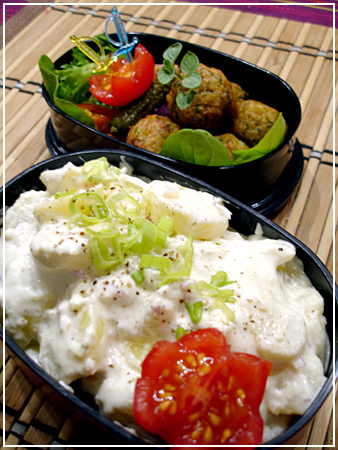 Homemade potato salad though, and the “meatballs” are falafels. They come pre-fried and just need microwaving – very handy! Then there’s some gardengrown salad and some cherry tomatoes, a skewered pickle and some red beets (which were the last of my freezer stash). Pretty simple bento, but I came home late from training and STILL made the potato salad from scratch then. (I make my own mayonaise – I can’t stand salad with storebought mayo.) So – simple-looking, but not that simple. About 600g of potatoes, boiled and still warm! Boil while you make the rest. Beat up the egg a little, then beat in the oil in a thin stream until emulsion forms. Add salt and mustard. I did the whole thing in a food processor and added 4-5 small pickles in the end, which got chopped up in the mayonaise. Saves time. Peel the potatoes and chop them into slices. Toss with the salad while still warm. Cool at room temperature and enjoy! I’m not fond of Austrian style (non-mayo) potato salad, which is made with broth. But my grandma swears on making her own mayonaise for mayo salad, and I love that! Adding yoghurt or sourcream makes it a *little* less fatty, which is also good, and fresher. Sorry for the dearth of posts recently – I’ve been on a much needed vacation first to Austria (where apparently Meeta has been as well – view her travelogue starting here) and then chilling with family here in Sweden. I’ll be back in full swing soon with new ideas I’ve picked up on the way and possibly some details about my native country, Austria! Which I guess is true. But I still must admit that ice cream and coffee is an addictive and delicious mix. Here in Austria, we’ve had Eiskaffee*, or ice coffee, for a long time. Mix the chilled coffee with some milk (don’t make it too light, just a tad or leave it out completely). Spoon 2-3 balls of delicious vanilla gelato into the highball glass. Pour the coffee over the icecream (careful, the ice cream does float!). Make a pretty hat with the whipped cream and the chocolate flakes. I don’t need to tell you that you should enjoy, right? 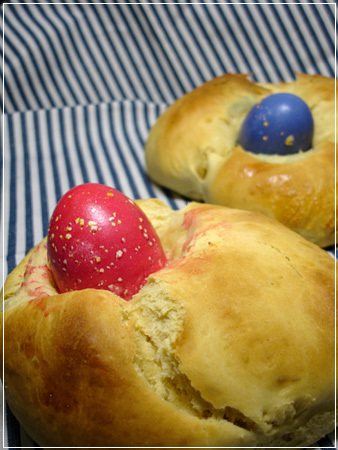 Osterpinzen are a traditional Austrian easter bakery made out of soft, sweetened yeast dough. 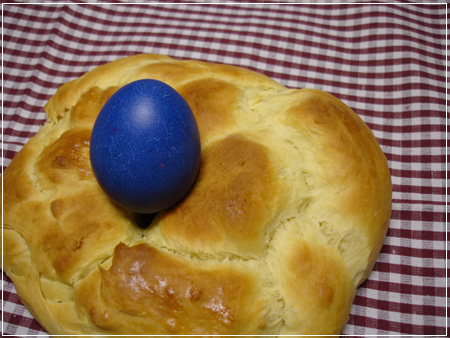 Austria is primarily catholic, so there are a lot of traditions around easter! 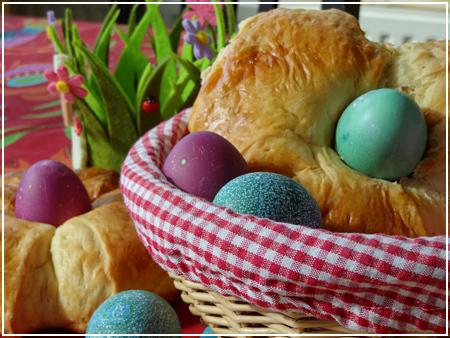 For example, on Easter sunday, this sweet bread, some hard-boiled eggs and a piece of ham or smoked meat are brought to Easter mass, so that the priest can bless them. Every member of the family eats a piece of all three foods later (usually at the Easter brunch after the mass and the egg-hunt! ), as it is supposed to pass on the blessing and bring good luck to you. I baked a second batch yesterday, tweaking the recipe a little and (in my opinion) succeeding much better than last time, so I can pass it on now! Since I baked more this time, the dough got a lot yeastier, and also softer. The proportions changed a little from the 250g flour recipe I had last time. 1. Warm half of the milk to room temperature in a bowl. Mix in the crumbled yeast and about a tablespoon each of flour and sugar. Cover with a damp cloth and let it rise in a warm place for about 15 minutes. It will rise up and get frothy as the yeast multiplies. This pre-dough is called a “Dampfl” in Austrian. I admit I had to look it up, much to the chagrin of my mother when I admitted to her I didn’t even know what a Dampfl was! I guess I fail at Austrian baking traditions. 2. Mix the rest of the milk, a splash of wine or lemon zest, vanilla sugar, the sugar and the butter in a bowl and warm to about 30 degrees Celsius. 3. Divide the eggs into whites and yolks. The whites aren’t used in this recipe. Save some of the yolk for brushing the dough before baking, and put the rest into a mixing bowl together with the flour, the milk-sugar-butter mixture and the risen yeast. Knead everything until the dough gets smooth and firm (if you use a food processor, it should be stringy enough to grab hold of the dough hooks). 4. Roll the dough to a ball, put it back into the bowl and cover it with a cloth. Put into a warm place to rise. When you see the surface starting to crack (about 20-30 minutes in), fold the dough again with your hands and let it rise another 30 minutes. It should grow some more by that time. I should have cut them deeper actually – cutting almost all the way through seems to be the ticket! 6. Bake at 180 degrees Celsius for 30-40 minutes, until the dough is cooked through (try with a needle). 7. 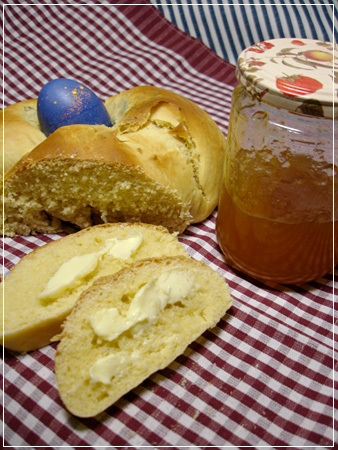 Let cool and enjoy with butter and your favourite marmelade! PS: I’m submitting this to Bread Baking Day #08, a baking roundup over at Wild Yeast. 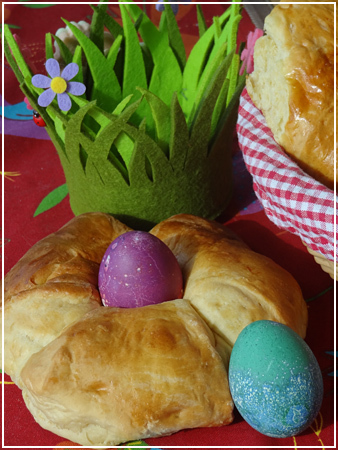 This month’s theme is Celebrations, so take a look and contribute your own spring celebration bakery! The BF ordered more of that delicious chard and feta strudel, so I was happy to oblige. 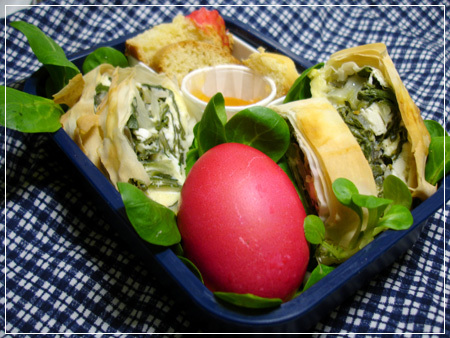 Other than that, the box contains Maché salad, a red easter egg and a cut-up slice of Osterpinze with grandma’s homemade apricot marmelade.